First of all, thank you SO MUCH for all of the information regarding my questions on the last post. I learned a LOT from all of you, so much that UPPER CASE is required to express my appreciation. I knew you would have the answers! 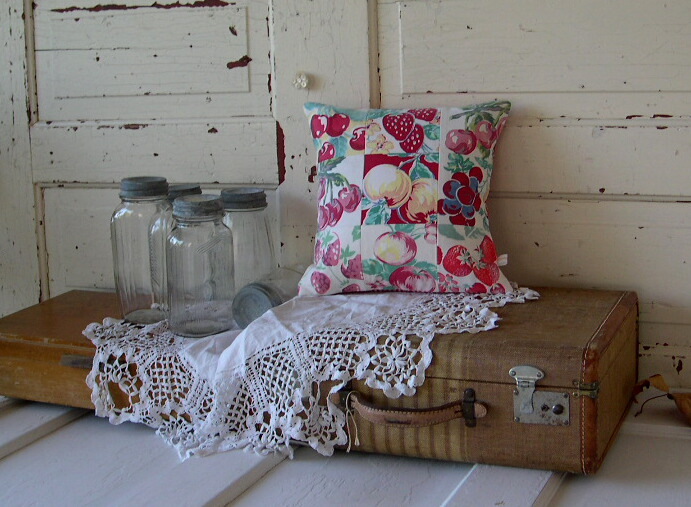 Meanwhile, I've been busy sifting through the 340 photos I took recently of vintage burlap bags, a giant fork & spoon, vintage typewriter keys, a wooden shoe, pillows I made, vintage fabrics I bought, vintage fabrics that were given to me and assorted yard-saled doodads. 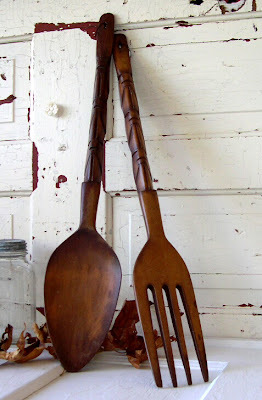 Some of the photos are for my etsy shop, PeppermintBark (why not a Giant Fork & Spoon, I say?! ), some were for this blog post and some were test shots of recent Doily Factory projects which are eventually headed to my other etsy shop, VintageHome. Even though it feels suspiciously like summer around here at the moment, the PNW rain is coming and the days I'll be able to take photos outside are numbered so I like to do a little practicing indoors to see what works. And voila -- the result. Which seems to be more in focus if the photo is clicked on to enlarge. So now I have an indoor set for photographing pillows. 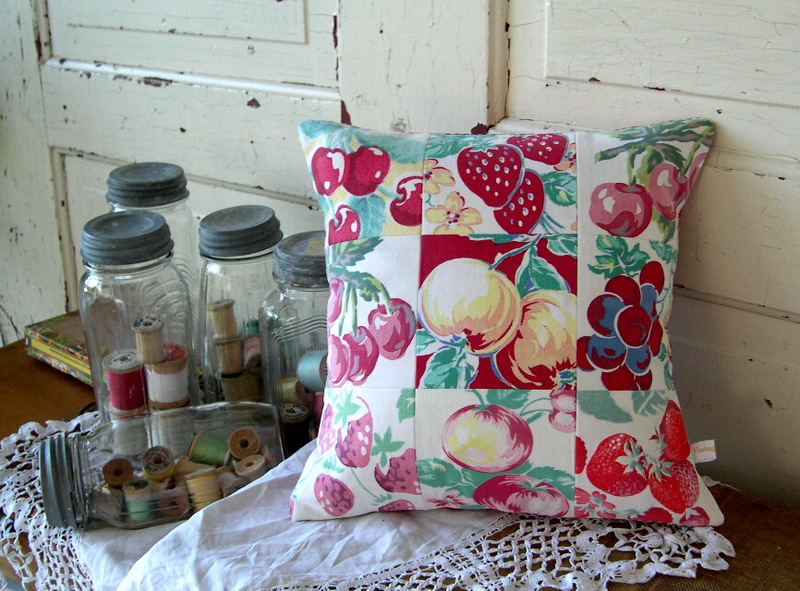 Just need to make some pillows. Here's a few additions to the vintage fabric stash. 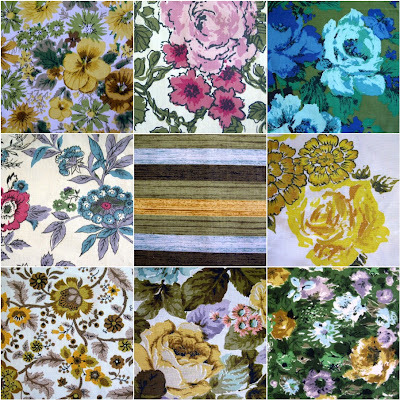 I'm quickly becoming addicted to the graphic florals from the '60s & '70s -- I love those big blue roses. But vintage tablecloths will always be my first love. These vintage beauties were a lovely surprise from Lisa at A Thing For Roses. I can't even tell you how much that middle fabric thrills me -- I've never seen it before and something about it really makes me vintage-giddy. Thank you Lisa, you're a peach! That is the perfect set to show off your lovely pillows! You have a very artistic eye. I don't know if I'd have the patience to tinker around that much with my photographs, but it does make a world of difference. Hope you have a wonderful day too! You are so welcome! I had a good feeling that you might enjoy that middle fabric. I know you will make something lovely out of it. Hope we can get together soon! So, you are having summer too? Craziness, isn't it? Those 70's fabrics have a decidedly fall-ish look to them, don't they. I can't wait to see what you come up with. p.s. Love your indoor photo studio. It's the perfect backdrop for almost anything you'd want to photograph. All your photos are pretty - but your latest fabrics....adorable. I understand the floral addiction. What, I mean WHAT are you going to do with the giant fork and knife? 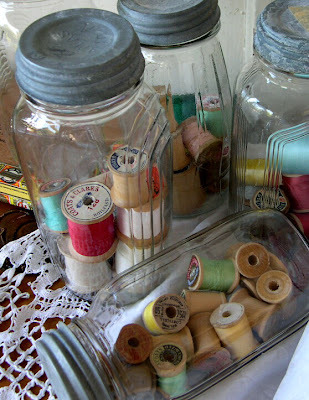 You could stage some really crazy pictures with the family at Thanksgiving, I suppose... Love those jars full of thread. Love those old typewriter keys too! Yay! Your fork and spoon made it to the Frontpage treasury on Etsy!!! Ha! 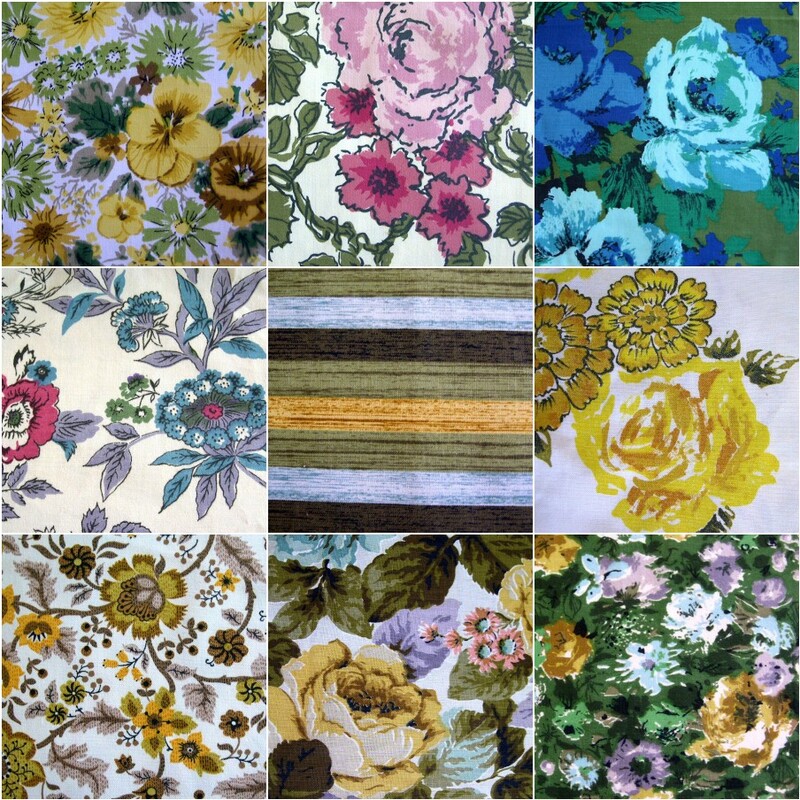 I just found a seventies floral tablecloth at a local thrift store. It was full of holes and stains so I used it to make a table runner (pics at the blog).